In the Republic of San Marino, the veneration of the Saint who, according to the legend, founded the Republic, is extremely deep-rooted and widespread. The legend tells how this master stone-cutter left his native island of Arbe in Dalmatia and came to Mount Titano to establish a small community of Christians anxious to escape the persecutions of emperor Diocletian. In 301 A.D., the first community from which the Republic of San Marino originated, formed. What is certain is that the area had been inhabited since prehistoric times, but the first document confirming the existence of an organized community on Mount Titano is the Placito Feretrano, a parchment dating back to 885 d.C. . Thanks to the wisdom which inspired the ancient free city of San Marino, the community was able to overcome perilous situations and consolidate its independence. The events of history were complicated and their outcomes often uncertain, but the love of freedom enabled the free city to maintain its liberty. San Marino boasts an exceptional tradition of hospitality. This free country has never refused asylum or help to those persecuted by misfortune or tyranny, whatever their condition or ideas. During the last World War, San Marino was neutral, and eventhough its population was made up of only 15.000 inhabitants, it gave shelter and asylum to 100.000 evacuees coming from the surrounding areas of Italy which was being bombed. Doing business in the world’s smallest Republic has its benefits. Not only because the country’s strategic position in the heart of Italy makes it easy to reach from all major European capitals, but above all because investors are able to benefit from a slim-lined tax system, tax relief for technologically-innovative projects, safe investments and a direct link with institutions. Strategically located in the centre of Europe (1 hour flight from Rome, Paris, Munich and Wien; 2,30 hours from London). 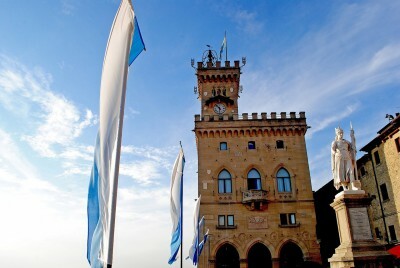 San Marino, even if it is not in the European community, as of February 2014 is off the Italian black list (Non-Cooperative Countries in the global fight against money laundering and terrorist financing), course in compliance with European directives.